This entry was posted on 25th May 2018 by makeanentrance. May is the month of Bank Holidays, which means two things – DIY and BBQs (weather permitting, of course). Up to now many parts of the UK have been fortunate in seeing regular sunshine this month. 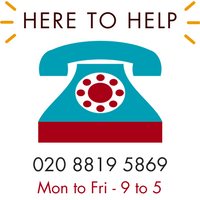 You might be thinking of making the most of it and organising a BBQ or garden party. If so, we’ve thought of essential Doormat Sets that will help protect your home from your visitors’ feet! With people moving between garden and house, it’s a great idea to have a pair of mats in place. This will provide a good opportunity for shoes to be thoroughly wiped, and save your floors from footprints. The best way to achieve this is by having a hardwearing mat outdoors for scraping away debris, and an absorbent mat indoors to soak up any remaining dirt and moisture. It’s also a good idea for the indoor mat to be big enough to facilitate the removal of shoes, without people having to step off the mat. Holding all of this in mind, we’ve put together a range of doormat sets which take the leg work out of searching for the best combinations. Both in natural coir, our ‘wrought iron effect’ coir/rubber doormat and decorative doormat make an attractive pair. These are ideal for homes with a period feel to them, as doormats have traditionally been manufactured from coir for centuries. Made from coconut husks, coir doormats have a natural finish that is excellent for scraping dirt and absorbing moisture. If you would like your mats to be more than functional, the decorative element of this set creates a lovely feature in your garden and entrance. As the saying goes: “A scraper at the door keeps the dirt from the floor”. 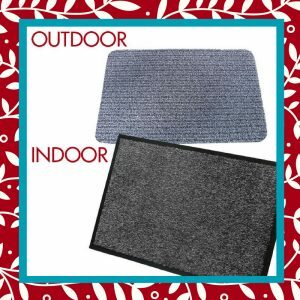 The ideal pairing in the world of doormats is an outdoor scraper mat and an indoor absorbent mat. This is exactly what our Functional Doormat Set consists of. Our super hardwearing polypropylene scraper mat and our highly absorbent cotton washable mat are a perfect match. With a variety of colours to choose from, you can even tone the mats with your preferred colour scheme. 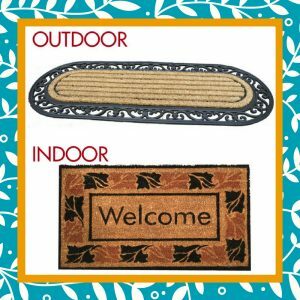 As personalised doormats are often designed for indoor use, it’s not often you will find a complementary pair that can be placed either side of your door. 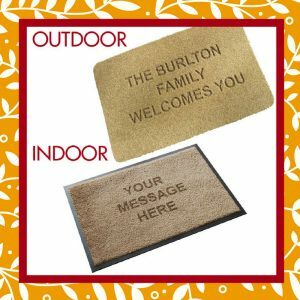 Our Synthetic Coir Outdoor Personalised Doormat and Machine Washable Personalised Doormat definitely tick the functional box. They also have a harmonising colour tone and can be personalised with a message of your choice. Perfect for situating in conservatories and by garden patio doors, our Washable Double Doormat can be placed in a ‘portrait’ orientation as a runner style mat, or a ‘landscape’ orientation to cover a double doorway. 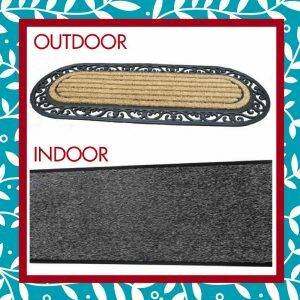 Matched with our ‘wrought iron effect’ coir/rubber doormat, this is an ideal pair for covering larger areas and protecting more of your floors. 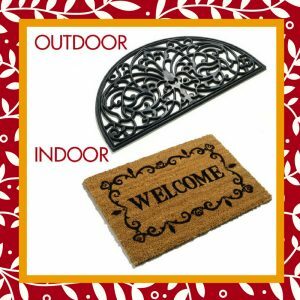 Our ‘wrought iron effect’ Half-Moon Rubber Doormat paired with our 60cm x 40cm Welcome coir doormat is a brilliant choice for small, but perfectly formed, spaces. The swirl pattern complements the ornate wrought iron design for a Parisian feel, and the alternative geometric ‘Greek Key’ pattern makes a striking contrast. Simply enter the corresponding coupon code for the value of your order at the checkout page to redeem your discount. Offer valid until 29th May 2018.